Lately I have been all about the sauces. And when it comes down to it, sauces are really the key for getting my kids to eat a lot of the healthier type meals I want them to eat. If there is something to dip into, they’ll try it. Currently on rotation is a herbed-cumin yogurt sauce, harissa maple cumin sauce and my favorite peanut-tahini sauce (adapted from Smitten Kitchen). For this recipe I simply roasted up halved sweet potatoes and slathered them in sauce, roasted again, and topped them fresh herb, chickpeas, and peanuts. There are so many options for these stuffed sweet potatoes, try your favorite sauce, top with more veggies or cheeses like goat cheese or feta. This meal is filling and can be served for dinner along with a big salad. Preheat the oven to 400 degrees. Cut the sweet potatoes in half and brush with olive oil. Line a baking sheet with parchment paper and turn the sweet potato halves over, flesh side down and roast for 45 minutes. While the sweet potatoes are roasting, make the sauces. In a mason jar or small bowl whisk together the harissa paste, garlic, olive oil, cumin, maple syrup. Season with salt and pepper. In a mason jar or small bowl whisk together the sesame oil, tahini, peanut butter, soy sauce, rice vinegar, sugar, ginger, garlic, and chili paste. After 45 minutes, remove the sweet potatoes from the oven, flip over. Take a fork gently fluff up the flesh, allowing for the sauce to sink down inside. For the Harissa Maple Cumin Sweet Potatoes, spread 1/4 cup sauce over top of the roasted sweet potatoes and top with 1/4 cup chickpeas. Roast for 10 minutes, remove from the oven and top with chopped mint. 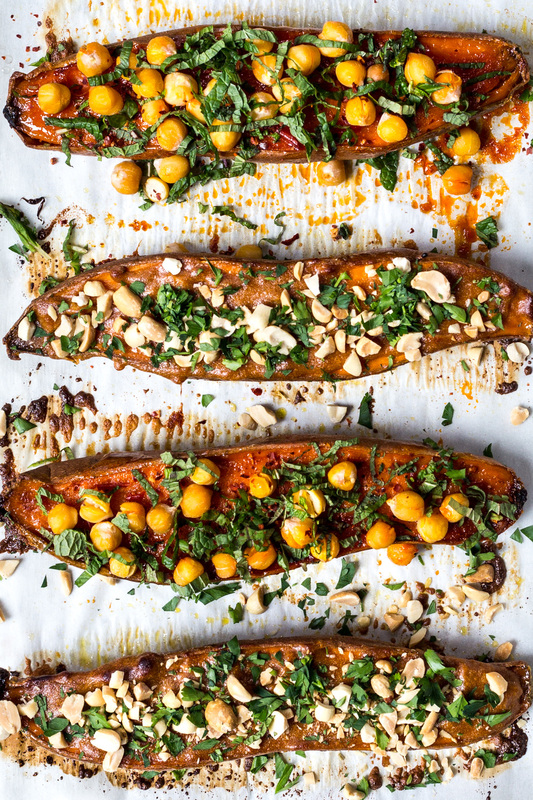 For the Peanut-Tahini Sweet Potatoes, spread 1/4 cup sauce over top of the roasted sweet potatoes and roast for 10 minutes, remove from the oven and top with chopped peanuts and cilantro.